Saturate your ritual space with the flashing colors of the Element of Earth. 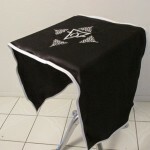 Available in 100% natural cotton or washable crepe back satin. Cotton runner measures approximately 18 x 44, satin runner is approximately 18 x 54. 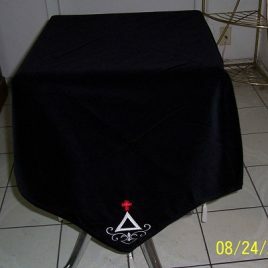 Full size cloth is approximately 44 x 44 in either fabric. Central embroidery is approximately 12 x 12. Cotton – wash gently in cold water. Hang to dry or dry on completely “no heat” setting. The heat of the dryer will cause all cottons to shrink. Iron on wrong size. Dry cleaning is another option. Satin – wash gently in cold water. Dry on medium setting. No ironing is generally required. However, if you do iron, choose a medium setting and iron on wrong side. 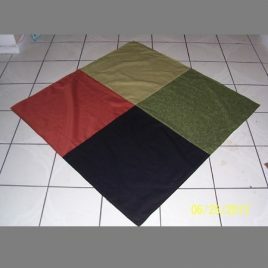 The 4 colors of Malkuth (citrine, olive, russet, and black) combined into an altar cloth. 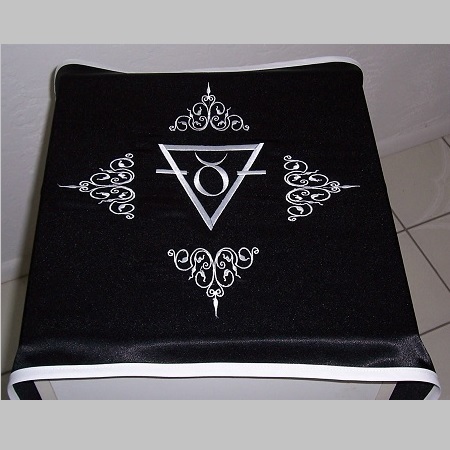 Cloth measures approximately 42" x 42". Fabric is 100% cotton. Use alone or over a larger size cloth. 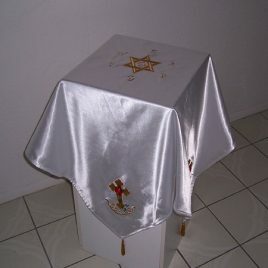 Exquisite cloth that combines the full central embroidery of the Solar Hexagram Cloth with the embroidery of the Rosey Cross cloth in each corner. Measures approximately 42" x 42". Available in cotton or crepe back satin in a variety of colors. Embroidery is done in all gold. Gold tassels in each corner.